Dusk on the San Gimignano skyline in the Province of Siena, in the Tuscany region of Italy. The lights of the San Gimignano skyline burn as dusk settles on the town for another day. San Gimignano, located in the Province of Siena, in Tuscany, Italy, was founded in the 3rd Century BC, and is one of the small medieval walled towns in northern Italy. It is mostly known for its medieval architecture, especially the tall towers that are lit up in the photograph. The Province of Siena is one of the most picturesque areas of Italy and it has attracted visitors for centuries for its stunning views and tasty food and wine. Skyline of the Town of San Gimignano at dusk, UNESCO World Heritage Site, Province of Siena, Region of Tuscany, Italy, Europe. 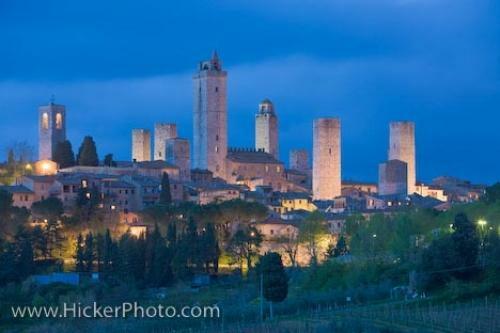 Photo of the San Gimignano Skyline at dusk in the Siena Province Tuscany Italy.